NEXT | What would your ideal Classic server be? BlizzCon dropped quite a few bombs on the WoW community: classic WoW realms, game-wide level scaling, and a new expansion. 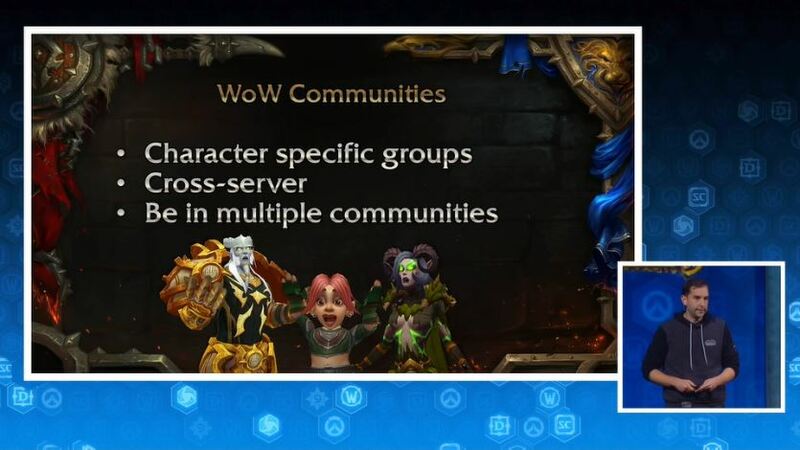 In the WoW Systems panel, Blizzard also announced a slew of new features to help us organize and communicate with other players. How will these features impact guilds? What about the upcoming expansion is the most exciting and relevant for officers and guild leaders? Let’s take a look! 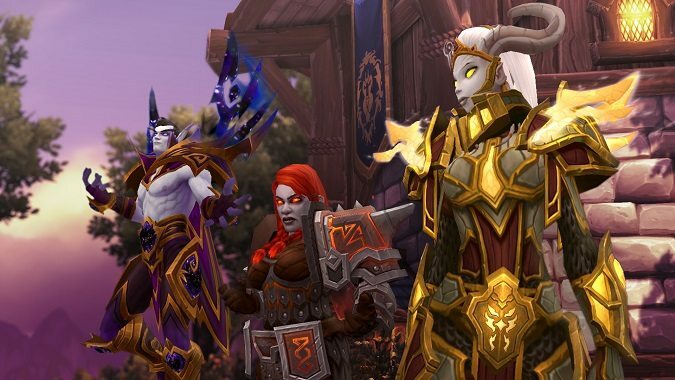 Perhaps the biggest announcement for guilds is actually one that doesn’t directly affect them: a new social feature within WoW that Blizzard calls “Communities.” Communities are a social group that transcends guilds. They’re a way to join up with like-minded members of the greater WoW community from any realm. 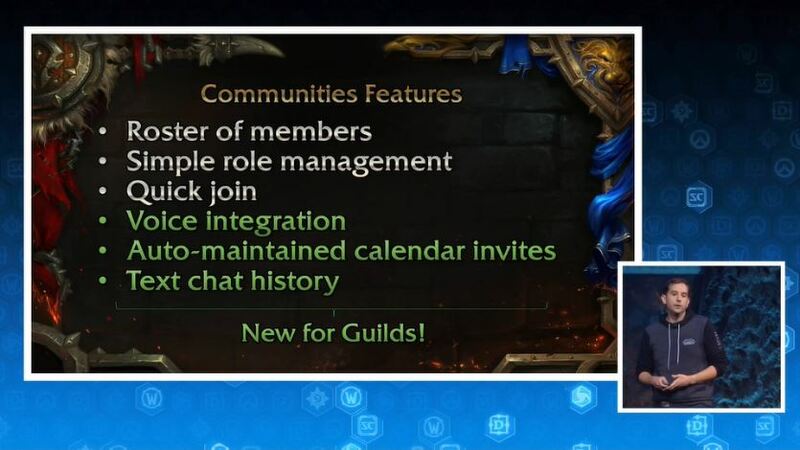 Communities will have many of the support systems that guilds have: ranks, rosters, chat, and calendar features. Like guilds, Communities will still be locked by faction. Blizzard said that communicating across factions is something that Blizzard Battle.net allows you to do outside of the game, and that’s where cross-faction conversations belong. But the existence of Communities poses an interesting question for guilds: Will guilds become irrelevant? With so much of the game now accessible to cross-realm parties, does a group of players who are limited to their own realm still have a place in the game? Communities are a powerful social organization tool. They’re like having your own customized Group Finder list that you can chat and party up with for each type of game mode that interests you. On many levels, guilds can’t compete with that. However, I expect that many players will still want to form and join guilds. For long-time players, guilds will still be the home for you and your closest WoW friends, the ones you’ve been on your realm with for years. Communities won’t change that. For newer players, they will probably look to join Communities first, but I think eventually many will find players within that Community that make them want to join a guild. Indeed, Communities could become a powerful recruiting tool for guilds. I believe raid teams will still group together into guilds more often than not when the majority of players are on the same realm. For Mythic-level raiders, you’ll have no choice but to group up on a single realm (or set of connected realms). Speaking of connected realms, one of the announcements at BlizzCon might have an unexpected benefit for guilds. 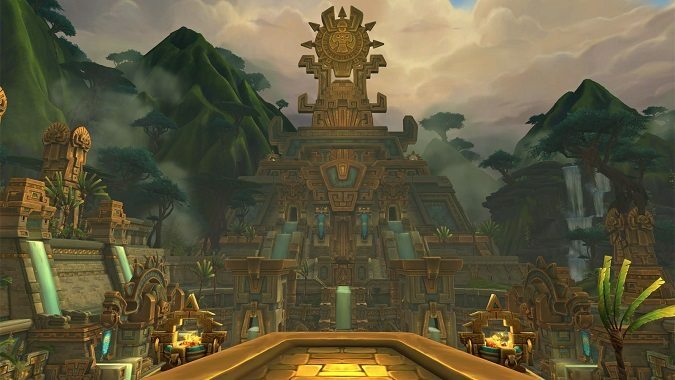 Blizzard will do away with the official distinctions between PVE and PVP realms. All realms will just be realms and players will be able to choose their own rule set. The ongoing problem with connected realms is that Blizzard has to join PVE realms with PVE realms and the same for PVP. But each type of realm has a faction imbalance. PVE realms almost always have more Alliance players, and PVP realms almost always have more Horde players. Once you take away that limitation, you can connect PVE realms with PVP realms. You can cancel out that faction imbalance. Suddenly Horde raiding guilds looking to add more members would have a much larger pool of players to choose from, and likewise for Alliance PVP guilds. I hope Blizzard plans to do this once the old realm rulesets go away. Blizzard also showed us two brand new types of repeatable endgame content: Island Expeditions and Warfronts. While these will almost certainly be queueable in the Group Finder, their description makes it sound like players might benefit from grouping up with guildmates. 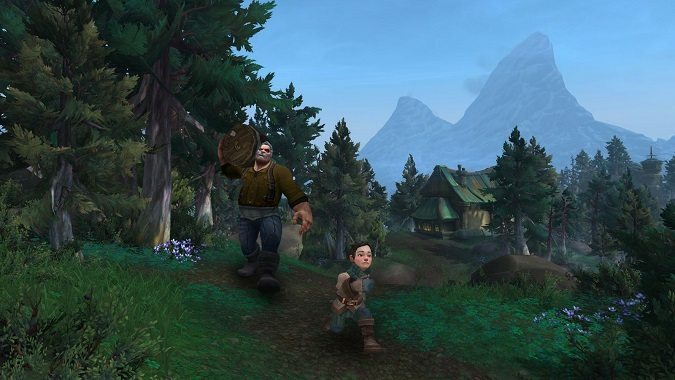 Blizzard talked about Expeditions as “puzzles” that must be solved by players while racing against advanced AI NPCs. The NPCs are looking to complete the same objectives before we do. They’ll be able to solve problems, set ambushes, CC us to escape, and who knows what else. More advanced difficulty levels will bring smarter NPC opponents. Coordination and voice chat might go a long way toward beating these Expedition scenarios at higher difficulty levels. Warfronts sound even more complicated. Inspired by the Warcraft RTS games, Warfronts will ask teams to choose how to optimize their resources, where to deploy forces, which players should advance and which should stay behind on defense. All of that might be fairly difficult for a PUG group. The level of coordination that a guild brings could make a huge difference here, too. It doesn’t sound like classic WoW realms will be available anytime soon. When they do go live, however, WoW will return to an era where guilds were absolutely essential to making progress in the endgame. Before the Group Finder, before queueing for dungeons, players who wanted to engage in any kind of group content had two options. The first, far less efficient, and far less appealing, was to stand in a major city and spam chat to get help. If you were a tank or a healer, people would usually jump at your offer. If you were a DPS, good luck to you… You could also spam-whisper people on your friends list. The second option was to join an active and helpful guild. In many ways, classic WoW and Burning Crusade were the golden age of guilds in WoW. Improvements that began in Wrath of the Lich King began to make guilds less necessary, and that trend has continued expansion after expansion. Creating a guild on a classic realm will be like going back in time in more ways than one. You won’t just be a group of friends there. You’ll be an absolutely essential support structure for players who want to run even the most basic group content in the game. 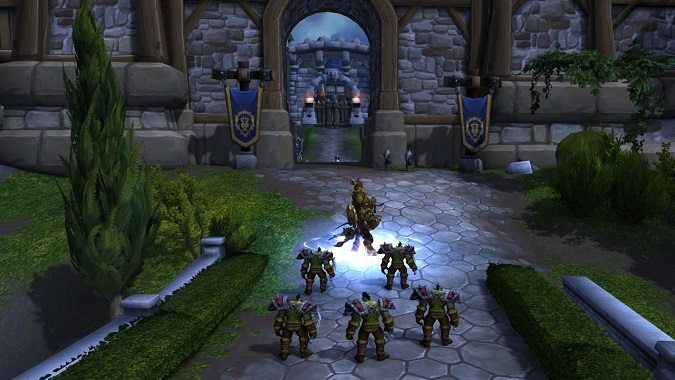 Finally, Blizzard announced a number of new technical features for both guilds and Communities. First, we’ll get the same voice integration that Overwatch has. Being able to communicate using the same software you play the game on is always a welcome way to simplify communication. This is a nice extra for guilds who don’t want to bother with setting up a Discord channel or other voice software. 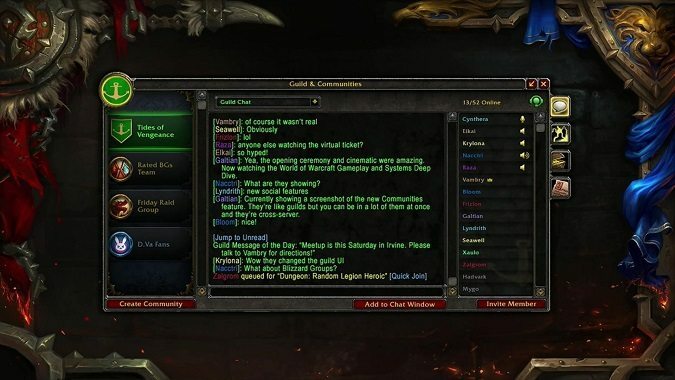 Next, Blizzard said that you’ll have access to your guild’s chat log history whenever you’re offline. You’ll be able to log in and see everything that everyone said about you while you were gone! For the average player, this feature brings a degree of convenience and a way to feel more connected to guild happenings. For officers, however, this is a game changer. We’ll no longer have to rely on “he said/she said” to determine if something bad went down in guild chat while no officers were online. Guild members won’t have to screenshot chat logs as evidence. Officers will be able to monitor every single thing that’s said in guild chat, for better or worse. Not all guilds will care about this. But sometimes a huge fight breaks out in gchat or some kind of crazy drama erupts. In those cases, it’s always better if officers can review what was actually said. Players can often misrepresent what happened, sometimes unintentionally. With the real logs, the officers can determine who the instigator was and what needs to be done about the whole thing. Blizzard also announced improved calendar functionality that should help officers to coordinate events. All in all these new features are a welcome improvement over existing systems. In the WoW Q&A panel, a player asked if Blizzard had anything else planned for guilds in the future, particularly when it comes to recruiting. Blizzard unfortunately did not mention anything specific for guilds and touted Communities instead. The future of guilds is a little uncertain right now. The current incarnation of the Group Finder makes finding other players to group with fairly effortless. That’s always been one of the main reasons to join a guild. Now with Communities, players will have even fewer reasons to join a guild. I think this can actually be a good thing in one sense, because players who don’t want to be in a guild won’t be forced to be in a guild. Guilds are better off without those players. Communities do offer a powerful recruiting option, but at the cost of additional effort on the part of the officers. Running a Community could be similar in scope to running a guild. Doing both well might become too much for one group of officers to handle. We’ll have to wait and see how this plays out. In Battle for Azeroth, the intensely coordinated gameplay of Expeditions and Warfronts might provide a niche for guilds to shine. 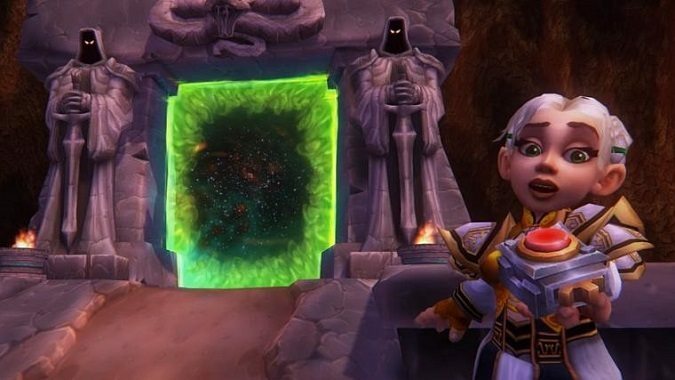 For those who want to relive the glory days of guilds, classic WoW realms will someday offer that experience.